Based in Bozeman, Bridger Insurance Agency is proud to serve the insurance needs of Bozeman as well as offering the same great services state-wide. Let us help you find the right auto, home, and life insurance to meet your personal needs. Contact us today for a quick, competitive insurance quote! Bridger Insurance Agency is a Bozeman insurance “independent agency” which means we can offer you the right insurance product at a competitive price instead of confining you to one insurance company. 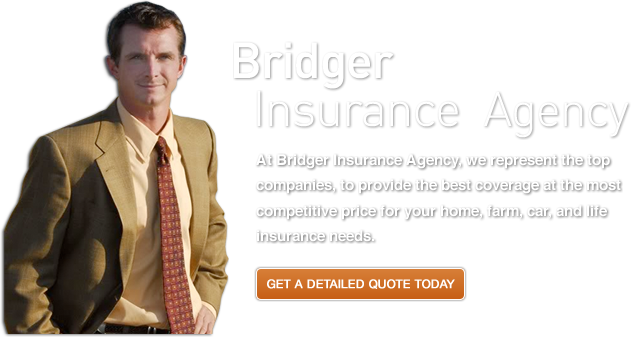 Bridger Insurance Agency specializes in home insurance, auto insurance, life insurance, and DUI/SR22 insurance, as well as offering multi-policy discounts. We serve our local Bozeman community and can also write policies across the state of Montana. At Bridger Insurance Agency, we represent the top companies to provide the best coverage at the best price for your home, farm and car needs. We’re a Bozeman Insurance agency here to serve you. Learn more about us, make a payment, make a claim or get a free quote today.